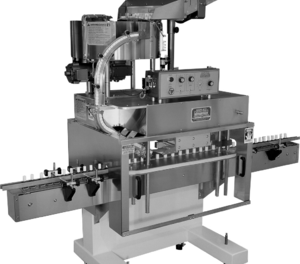 Fully automatic Over Capping / Lidding Machine requires only 44" of line space. Handles over caps, lids and fitments of all materials and styles from 13mm to 70mm. Portability allows versatility for automatic over capping / lidding; easily moved from one production line to another. Handles metal, glass, or plastic containers from low jars and vials up to 2-1/2 gallons. Comes with a standard rotary cap feeder. Can handle cap diameter from 8mm to 120mm standard flat caps and vials to 2-1/2 gallon containers. One-piece solid welded construction cabinet epoxy painted for both cleanliness and easy maintenance. - Caps of all materials from 8mm-120mm.